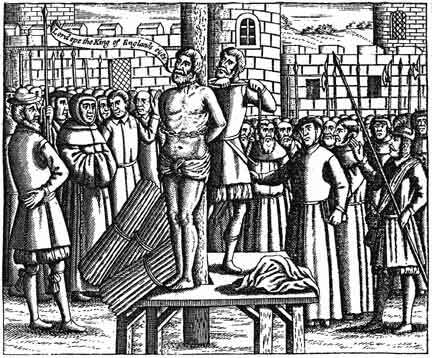 “Lord, open the King of England’s eyes!” cried William Tyndale at the stake this date in 1536 … just before he was strangled and burned. “Translated the Bible into English,” reads Tyndale‘s epigraph; in the Protestant blossoming, this Herculean academic labor was also of itself a dangerous religious and political manifesto. 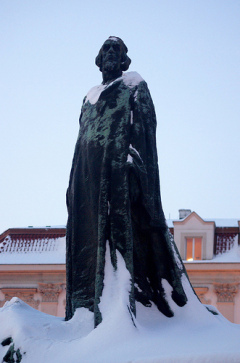 As with Martin Luther’s translation of the Bible into German, Tyndale’s English version threatened, and was intended to threaten, papal ecclesiastical authority. In undertaking the work, Tyndale defied the 1408 “Constitutions of Oxford”, an English clerical pact further to the suppression of the Lollards and kindred post-John Wycliffe heresies which expressly prohibited rendering scripture in the vernacular. 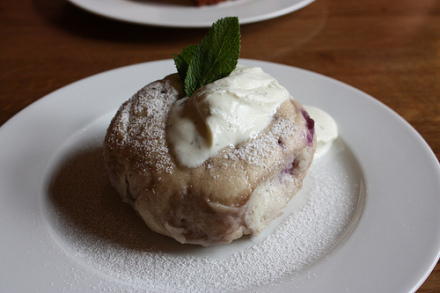 Tyndale would give his life to, and for, that ploughboy. On the lam in Protestant Germany, Tyndale produced an English New Testament, and then an Old Testament, of startling poetry. The scholar also kept a reformist voice in the day’s robust theological pamphleteering — trading fire, for instance, with Sir Thomas More. 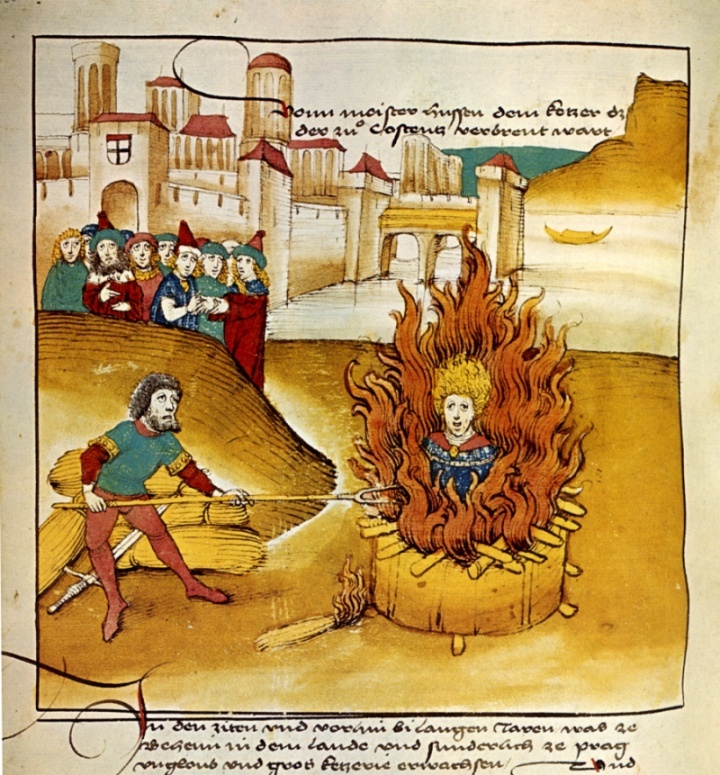 Even when the once-staunch Catholic Henry VIII broke with Rome over Anne Boleyn, the English manhunt for Tyndale continued: Henry’s reformation did not share radical Protestant objectives like scriptural authority, and the king was not shy about enforcing his version of orthodoxy. Tyndale was equally stubborn in defense of his life’s mission to put a Bible in the hands of the English ploughboy. 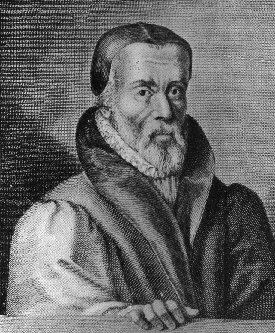 Offered the king’s mercy to return and submit, Tyndale countered by offering his silence and martyrdom if Henry would but publish the Good Book in English. I assure you, if it would stand with the King’s most gracious pleasure to grant only a bare text of the Scripture to be put forth among his people, like as is put forth among the subjects of the emperor in these parts, and of other Christian princes, be it of the translation of what person soever shall please his Majesty, I shall immediately make faithful promise never to write more, not abide two days in these parts after the same: but immediately to repair unto his realm, and there most humbly submit myself at the feet of his royal majesty, offering my body to suffer what pain or torture, yea, what death his grace will, so this [translation] be obtained. Until that time, I will abide the asperity of all chances, whatsoever shall come, and endure my life in as many pains as it is able to bear and suffer. Luckily for posterity, the English crown wasn’t biting, leaving Tyndale’s mellifluous rendering of Holy Writ to enter the English tongue. And leaving Tyndale, eventually, to enter the martyrs’ ranks. In 1536, an English bounty hunter befriended the fugitive translator and betrayed him to the authorities in Vilvoorde, near Brussels. It was the Catholic Church and the Holy Roman Empire that did the dirty work of their rivals in the Isles. And — the Lord works in the mysterious ways, they say — Tyndale’s dying prayer was indeed answered. By the end of the decade, a Bible in English drawn from Tyndale’s version (revised by former Tyndale assistant Myles Coverdale under Thomas Cromwell‘s direction; prefaced by Thomas Cranmer) was by regal authority placed in every parish of the Church of England. Audiophiles should consider this podcast from a Protestant perspective, located here.